James Roberts spent four years working for British Airways and its subsidiary British Regional Airlines, ending up as a Regional Business Manager. 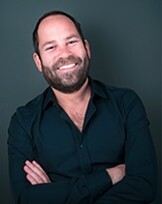 He completed a six-month consultancy contract with Siemens, as Travel Manager for their business worldwide, and spent four years with a UK-based travel recruitment consultancy before establishing Progressive Travel Recruitment in 2005. He has been involved with the travel industry since 1997 and specialises in international travel and hospitality recruitment up to executive level, as well as headhunting. He has excellent connections on every continent.